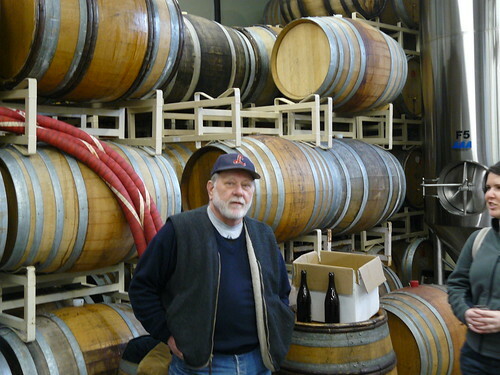 Owner Art Larrance with barrels of goodness at Raccoon Lodge/Cascade Brewing in Portland. Check out Part 1 and Part 2 of my Portland trip if you haven’t seen them. After checking out of the hotel on Sunday, we headed over to Whole Foods to stock up on some of the gems you can get in Portland that don’t make it up to Seattle. I was most excited to see 750ml bottles from The Bruery, located in Southern California. I’ve never tried their beer, but they made a splash on the craft beer scene in 2008 and showed up on many writer’s “breweries to watch” lists for 2009. We picked up three of their beers at Whole Foods, as well as some Hair of the Dog Blue Dot, a couple from Laurelwood, some India Pelican Ale and several others. Whole Foods selection isn’t as large as the great specialty beer stores in Portland/Seattle, but they seem to get most of the special releases and their Beer Specialist, Scott Kulick, stocks plenty of great beers with the space he has. Big thanks to Scott for helping us out on Sunday (and, to the cheese woman for giving us samples of some amazing cheese and fig spread that we couldn’t help but buy). – They’ll soon be purchasing (or, maybe already have) 2 large wooden wine vats to increase capacity for producing barrel aged beers. This will likely allow them to expand their bottle distribution up and down I-5 on the West coast. – The Cascade Apricot, previously not available in Seattle, was delivered to Seattle last week (28 cases to Click accounts). The listing of new beers on Bottleworks’ blog confirms this. Go get some! – They’ll also be sending their Tripel up to Seattle in bottles soon (if I remember that correctly). – Art has a serious passion for beer. He was gung-ho about talking to Jeanne and I, and his love for Oregon beer and his pride in the state really shows. He’s truly excited about pushing their beers and making a name for themselves by providing some of the best sour beers available. – The first barrel aged beer they produced was an IPA. They did an experiment to try and recreate the voyage of an IPA from England to India. They threw an IPA in wooden barrels and served it at different time periods along “the trip”. – Cascade will ship their 750ml beers to any state that legally allows it. Give them a call and place an order. After a bite to eat (great happy hour deals all day on the weekends! ), Jeanne and I were off, but not w/out bringing a few 750ml’s of Cascade sours with us. Our last stop was at John’s Market Place. I’d heard this place rivals Belmont Station, but I’d never seen it for myself. Holy crap. Holy crap. Holy crap. This place has an insane amount of beer available…Belmont is stellar, but I think the sheer volume and wide selection here beats anywhere else I’ve ever been. We picked up three additional Bruery beers that we didn’t find at Whole Foods, as well as a bunch of other stuff. The New Belgium Lips of Faith Dark Kriek was a nice find as well. The selection at John’s is indeed grand, but the place is far from perfect. Their is beer stacked everywhere, and they place seems quite unorganized and run-down. The aisles are really tight. They have a lot of beer sitting around that looks like it’s been there a while, and much of it is room temperature. But, as long as you’re careful with what you buy there, the place is paradise. Like I said in my first post on this trip….this was one of my best Portland visits ever. I’ll be looking forward to the next one, whenver that may be! You can see all of the photos from my trip on my Flickr page. Um, we went a bit overboard on our beer haul. Who's going to help Jeanne & I drink all of this? Love the ‘Beer Haul’… that is awesome! You are truly deranged …in a good way :). I must check out Raccoon Lodge & John’s Market Place next trip down. Had the Cascade Sour Red last month at the Stumbling Monk and a bottle of the Apricot on Sunday. Very excited to see more beers from them. I live a mile from John’s. Actually was here for nine months before I found out about it – had passed by a few times and failed to wander in because it looks like a never-been-updated General Store. Your reaction was identical to mine. Just jaw dropping. The foreign selection alone is insane. Exceptional haul – you’ve got some winners in there. 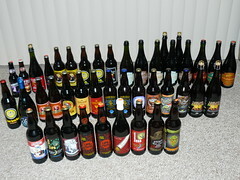 I have scrutinized the beer haul photo in great detail. Awesome. Truly awesome. You can get that Stone Cali-Belgie IPA at Ken’s Market up on Greenwood Ave in Seattle. I haven’t tried it yet, but I’m intrigued. yeah, dude, i’ll venture over for a taste of that. i have a similar deal in my downstairs closet. my wife is constantly trying to get rid of it to create space. which leads me to another point–my wife serving the savory specialities when friends come over. I look like a cheap jack#ss when i jump in and stop her from serving a 2006 Celebration Ale.